When a discussion comes to hiking in Costa Rica, it’s always the same question : “Have you been to Monteverde?” Finally, the answer is yes! But people have been bragging so much about this place that it was not quite what I had imagined it would be. Don’t take it wrong, it is beautiful. It is also convenient if you’re not planning on spending that much time in Costa Rica, since it is close to the beaches of Guanacaste and not too far from San José either. So why am I complaining? Well, first of all, don’t expect to spend time in a remote village and get a chance to practice your Spanish. I mean, of course, if you really want to, you can. But I had the impression that the area is mostly populated by foreigners attracted by “eco-lodges” (I won’t get into details here to try to define what that is, but it is a well-spread concept in Costa Rica and it’d be interesting to see what’s behind it) and tourists who come to visit. Probably the most ugly looking creature I’ve ever seen, an armadillo. The day after, my friend and I decided to hike up the Cerro Amigos trail, which is the highest peak around (not very high though, about 1800m). Besides the Morpho butterflies flying around us on the way up, it is everything but a nice trail. You need to get to hotel Belmar where the beginning of the trail is hidden on the right hand side (not very well hidden though). But! It is definitely worth going up there. After an hour or so of tough climbing, you arrive at the top to discover a weird area with antennas and other not too pretty things. It wasn’t the case when we were there but people say that you can see the Arenal Volcano when the sky is clear enough. When we arrived there, we walked past the house on the left hand side and decided to follow a cool wild-looking trail down. In a minute, we were in the middle of nowhere, hiking through beautiful dense cloud forest. The compass confirmed that we were on the edge of the Monteverde reserve. We didn’t quite know where we would end up, but the trail was obviously leading somewhere. After an hour or two, we met some people who confirmed we would arrive to another reserve if we keep following the trail. And we did eventually. After a couple of hours, we arrived at the Santa Elena Cloud Forest Reserve, right next to Monteverde so you can easily walk back to wherever you’re staying. The best part was probably the unexpected presence of a kiosk right before the end of the trail (there is not a single shelter in the Monteverde reserve), where we had what seemed to be the nicest lunch ever…and some locally grown and roasted coffee, por su puesto. Coffee grown around Monteverde by thr!ve coffee farmers, roasted at the Common Cup, Monteverde. Where else to go to hike through cloud forests in Costa Rica? 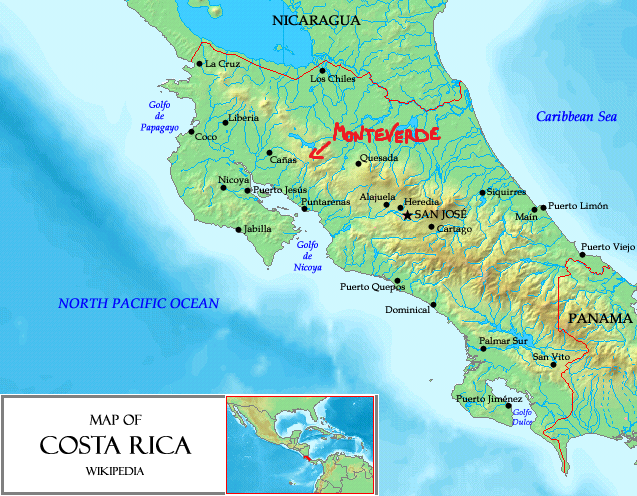 Good news, wherever you decide to go in Costa Rica, cloud forests will most likely never be very far. One easy option is the Braulio Carrillo national park, which can be reached from San José in either a 30 minutes bus ride or a slightly longer but more scenic one if you’re going on the other side to the Barva volcano. My absolute favourite is around Chirripo, but if you don’t feel like climbing the moutain, just stay in San Gerardo de Rivas (1 and a half hour east of San Isidro del General) and there you’ll have options, my favorite one being the Cloudbridge reserve. lovely as always to read about your adventures! Hey Tim! The kind of tip I like, thanks a lot, it sounds like a really cool plan (great photos as well!). Thanks, I get my informations by going directly to the field!